Over the next three weeks, we'll be taking a look at the films of 1971 -- as usual, seen through the prism of the Academy Award Nominees from that year. Not as usual, we will also take a look at the corresponding nominees of this year's Oscars. How does J.K. Simmons stack up alongside Ben Johnson? What is the parallel between Alexandre Desplat and Jerry Fielding? Can we trace an evolution, or possible plateau, in the 43 years that have passed between The French Connection and Selma? These are the types of questions we will try to ponder. Later, though. For now, let us concentrate on one of my favorite categories to have gone the way of the dodo -- the Adapted Song Score (aka...well, see post title). I'm still not entirely sure why they discontinued the category (is it because no one could top Prince? ), especially since the minimum required was only three. Easy enough, I should think. This year alone could have seen nominations for Annie, Begin Again and Into the Woods, all of which use both songs and music derived from those songs to create a complete score. Previous years would have been able to honor Frozen, True Grit, Black Swan, Ray, Walk the Line -- plenty of options! Bedknobs and Broomsticks, a Disney musical about three orphans, a witch, and David Tomlinson in World War II England. The Boy Friend, Ken Russell's bizarre adaptation of Sandy Wilson's pastiche of 1920s musicals. Fiddler on the Roof, the box office sensation adapted from the Broadway sensation. 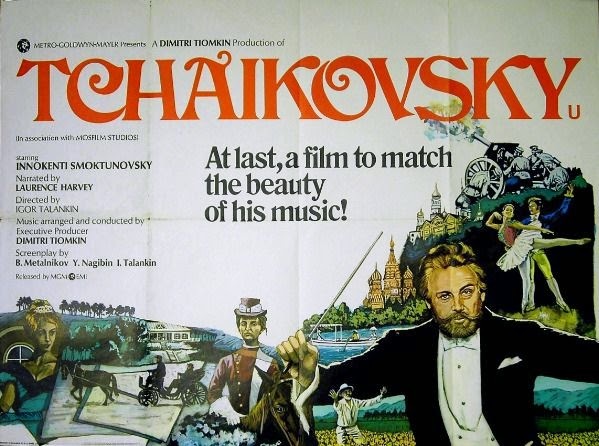 Tchaikovsky, an almost 3-hour biopic of the composer made in Russia -- this was the more serious, "legitimate" cousin of Ken Russell's flamboyant, mad-cap look at Tchaikovsky's tumultuous marriage and secret homosexuality, The Music Lovers. And Willy Wonka and the Chocolate Factory, a box office bomb that has since gone to become one of the most beloved films of all time. The multiple arrangements of "The Age of Not Believing" I have no qualms with, but overall it's not the most memorable of song scores. One musical number was apparently cut from Mary Poppins and recycled here; you can tell. The whole production reeks of an attempt to recapture those old glory days, right down to the tunes. Exquisite arrangements of Sandy Wilson's musical score! Slightly off-tune piano and snare keeping the harsh realities of the broke theatre company in plain sight; larger orchestral arrangements -- some complete with Wurlitzer! -- for the fantasy sequences. Ingenious, inventive, and unforgettable! Expands on the original score to provide a fuller, more epic sound; flutters in hints of songs like "Miracle of Miracles" and "Far from the Home I Love" unexpectedly, but not distractingly; indispensable. The music of Tchaikovsky is big and beautiful and brilliant. So what's the problem? Tiomkin's choices do not resonate as deeply as that of competing biopic The Music Lovers. The chosen compositions do not always complement the scenes, and the repetition of The Queen of Spades does not come off as profound as it seems to be intended. Your Winners for the 2014 Hollmann Awards!